- Reapers operate in specialized strike teams. A Reaper frigate can hold any number of strike teams, but they more often than not operate in teams of six. The most prestigious of the teams is always Reaper Team 1; here, the most skilled, accomplished, and veteran Reapers are placed. PCs will start the game as Reaper Team 3. Their success or failures during missions will determine how they advance over the course of their careers as Reapers. Critical failures in missions could see them placed on a lower tier team while critical successes may raise them accordingly. What team the PCs are on will determine what roll they play in missions. Furthermore, it will also affect how NPCs view them and interact with them in game. Furthermore, upon completion of a mission I will roll 1d10 to determine how well the other deployed Reaper teams did. This is mostly for narrative purposes and will help grow the reputation of each team for good or bad. Teams kept in reserve will not be rolled for. - Gear will be acquired using the PCs Influence stat score modified by availability and craftsmanship of the item per Dark Heresy 2nd Ed. RAW (pg. 141 CRB). 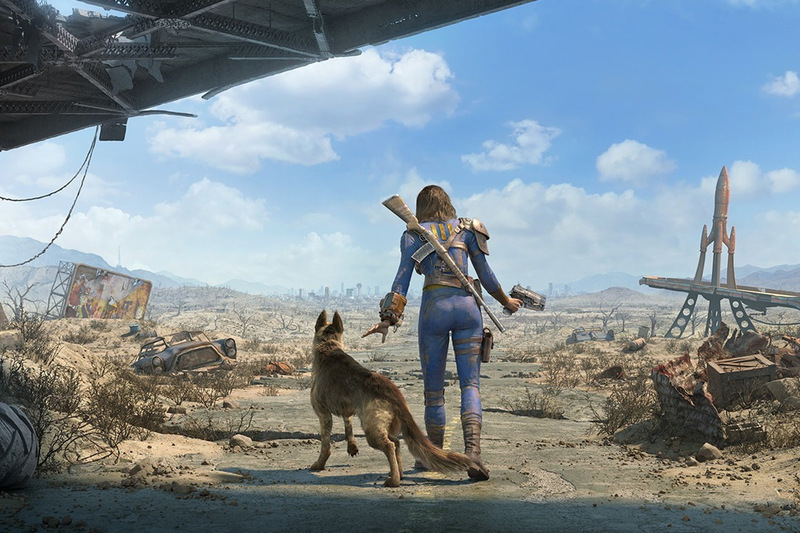 CHANGES: Ubiquitous will no longer be "automatically" acquired. Instead it will confer a +60 bonus to your requisition test. - In addition to the DH2 acquisitions rules, the following "amount" modifiers from Black Crusade (pg. 306) will be added to reflect the small-squad tactical feel of being in a Reaper squad. - The crits have been changed where on a RF that does damage to an opponent, roll 1d5 on the corresponding critical chart table and apply the effect to the target. It's just a little more thought out than simply exploding damage on natural 10s. - Players do not need to roll to confirm righteous fury. RF is automatically successful on natural 10s. One, this is to make the game a bit more deadly (but since only Elite and Master level enemies can inflict RF, it makes the game more exciting for the PCs) and it also speeds of the pace of play. As well as using the updated skills, we will also be using their updated level names. This is a living list and may be subject to changes. - Rapid Reload (Talent amendment): Rapid Reload now only applies to weapons in which the PC has training in. If you do not have training in a weapons system and attempt to reload it, regardless of if you have the Rapid Reload talent, the reload time remains as listed in the weapon profile. ++ ANY talent that modified combat, such as Rapid Reload, will now only benefit players as long as they have the proper weapon's training to go with it. For example, Deadeye and Sharpshooter will only negate the penalties of called shots when using weapon's systems that the PC is proficiently trained with. - Suppressing Fire (Rules amendment): PCs in cover gain a +30 bonus to their WP test to resist pinning. Once pinned, in contrast to the RAW, PCs and NPCs have the option to flee the source of their suppression in addition to looking for cover and taking half moves, should they choose. If they opt to do this, they run at their fastest speed away from the source of the suppression and cannot do anything else that turn - even looking back. The enemy receives a free round of actions against them taking -20 to BS against them as well as +20 to WS against them. Pinned characters must then regroup at the last "safe" place. - Hatred (Talent amendment): Hatred now applies a +10 bonus to hit to both WS tests AND BS tests against the hated enemy. - Weapons Training (for Vehicles): When operating a vehicle-based weapon, players with half of the trainings necessary (for instance having Las training but not Heavy training when operating the Multilaser) will suffer a -10 penalty to fire rather than the -20 penalty that is required when having no training at all. This way, characters familiar with the kick of a bolt, but not the balance and weight of a heavy bolter can still operate the weapon somewhat effectively. - Jaded (Talent clarification): PCs with the Jaded talent will never need to test WP against Fear (1) creatures/conditions as these are listed as "mundane" on pg. 305 of the CRB. They will still have to test fear as normal against creatures/conditions with Fear (2) or higher. - Vehicle Hatches (House Rule): Players will need to spend a half action to shut and lock hatches/doors on all vehicles they are riding in. If they do so, they will not be able to simply jump out of the vehicle should it catch fire or take catastrophic damage; however, if they do not, enemies will be able to open the doors and breach the vehicle with ease. This will be up to the players - if no one voices their intent to do this, it will always be assumed that the vehicle is unlocked. - Ork Dispersion Grenades: In addition to their normal rules (anti-plant grenades), OD grenades now also remove any Unnatural Toughness bonuses from Orks and Ork kind. In addition to this, Orks exposed to the gasses must pass a -10 Toughness test or gain a level of fatigue. - Attacking Vehicle Motive Systems: Attacking a vehicle's tires/wheels (provided the vehicle has tires to target) will require a called shot. This may be subject to change depending on the type of tire a vehicle has. Destroying a tire will cause the operator of a vehicle to suffer -10 to operate tests/tire as well as reduce the movement of the vehicle by 25%/tire destroyed (assuming the vehicle has four tires total). Furthermore, if in motion when the tire is destroyed, the operator will have to make an immediate -10 operate test or go out of control on the following round. - Snap-firing (Spray and Pray): A character who is sheltering behind enough cover that it could conceal their entire body may opt to Snap Fire when making shooting attacks. The character essentially only holds their weapon out of cover and fires in a general direction. Doing so results in a -20 BS penalty to hit anything in the area. Subsequently, all shots at the shooter suffer a -20 BS penalty until the start of the shooter's next turn (essentially a called shot on their exposed hand). This attack cannot be used in conjunction with an Aim action. - Battle Damage (Armor Rules): After so many hits - decided by me and based on armor quality/type - PC armor will sustain "battle damage." At this point, players can either opt to fix it themselves (Tech Use/Trader Armorer), or they can attempt to re-requisition a new suit. Armor with Battle Damage suffers from -1 AP (all; as it represents the entire set of armor taking a beating) per mission until repaired or replaced. Once it gets to half its original AP, a movement penalty will also be incurred. A character who who chooses to wear damaged armor as a badge of pride can earn more "badass points" and fame with NPCs, similar to how a PC who goes without a helmet in Deathwatch gets rewarded, as well as more technical rewards. It's more dangerous, and probably stupid, but you look cool doing it! - Dodging/Parrying (Rules Amendment): DoS will only come into play when dodging full auto fire/Swift and Lightning attacks or using parry vs a WS standard attack. - Called Shot (Head) (Rules Amendment): Successful called shots to the head will extend the Righteous Fury range to 9 or 10. - Sneak Attacking (new rule): When a successful opposed silent move test places a PC/NPC in melee range of an enemy, damage will be resolved as follows: the attacker will gain a free called shot and a free RF on a successful attack roll. Troop-level enemies will die outright, but elite/master level enemies will suffer damage as normal. This rule can also be used against PCs. Furthermore, some troop-level enemies with unnatural toughness will not die outright at GM discretion. - Prone (movement/stance amendment): Aside from the standard prone conditions (-20 WS, -20 Evasion; +20 WS vs prone opponent), when lying prone, PCs and NPCs will gain +10 BS when firing due to the more supportive nature of the firing position and heavy weapons will be counted as braced. Furthermore, ranged attacks vs. a prone target will be at -10 BS due to their smaller profile; Falling prone is a free action. Standing up again is a half action. - Mono-edge (upgrade amendment): Weapons gaining the mono-quality no longer have a static pen 2. Instead, they add (+2) to the existing pen of the weapon. - Cover (rule clarification): When attacking an opponent in cover, any damage value that surpases the armor of the cover will be transferred to the target. Furthermore, the armor value of the cover will be reduced by 1/2 the damage that was able to get through. - ***All Out Attack (rule amendment): All Out Attacks follow the rules as normal with the following changes: On a successful AoA, weapons gain the Proven (3) quality (or the level of Proven is increased by 2 if the weapon already has it). Furthermore, pen/dmg on a successful attack is increased by 1. - Influence (new rule): This mechanic will work much in the same way as it does in Dark Heresy 2. As the team does more heroic deeds and accomplishes more missions, more people within the Empire will have heard of the unit and the prestige that comes with being a part of it; they will not necessarily know your PC personally. This will have in-game ramifications with who notices you, what pull you have, and the types of gear you can requisition. It will also be the determining characteristic to determine whether or not you can acquire certain gear. - Tactics (Int) (New Skill): Skill Groups: Air Combat, Armoured Tactics, Assault Doctrine, Defensive Doctrine, Orbital Insertion Procedures, Recon and Stealth, Void Combat; Drone Warfare, Kauyon, Mont'ka (very flexible; talk with me about ideas for tactics). Each new learned tactic costs 200xp. Tactics is the practical application of military knowledge in the field of battle. It differs from the various Lore Skills in that it relates directly to "on the ground" combat manoeuvres and actions rather than a broad theoretical or strategic view of warfare. It also differs from the Command Skill in that Command allows the direction of troops but does not grant any special knowledge in how best to use them. A character can use Tactics at any time when he wants to determine the best military course of action in a combat. This could be anything from the best position to suppress an entrenched enemy before an assault to picking a good landing zone when coming in under fire. Failing a Tactics (Assault) Test, for example, might mean facing a concentration of a defending force or hitting a stronger line of fortifications. A more detailed look at Tactics can be found on pg. 105 of the Deathwatch CRB. - Vehicles and Initiative (rule amendment): The skill of a driver has an important implication for how quickly a vehicle responds in combat, with more skilled drivers having an important edge over less skilled drivers. A character with Drive or Pilot +10 adds +1 to their Initiative roll when controlling a vehicle, whilst characters with Drive or Pilot +20 adds +2 to their Initiative roll when controlling a vehicle. *** These rules will be playtested and subject to removal if they are deemed unecessary/overpowered. - Each classified competency comes with a +5 to the appropriate characteristic. For Example, Precise Hunter comes with +5 BS, while Adept Machinist would come with +5 INT. - Tau players will have access to Rifle Marksman and Pistol Marksman. Both have the same effect, and all Tau start with at least one of the two (your choice), at chargen. The other can be taken for +100 XP. **No longer relevant due to Aptitude system switch. Pulse Accelerator (gear amendment): In addition to increased range, to account for the increased velocity of the pulse particles, all attacks within close range will add 1/2 PC's BS bonus (rounded down) to penetration. Ex: a PC with a BS of 51 would add +2 pen to an attack with a pulse accelerator at close range. 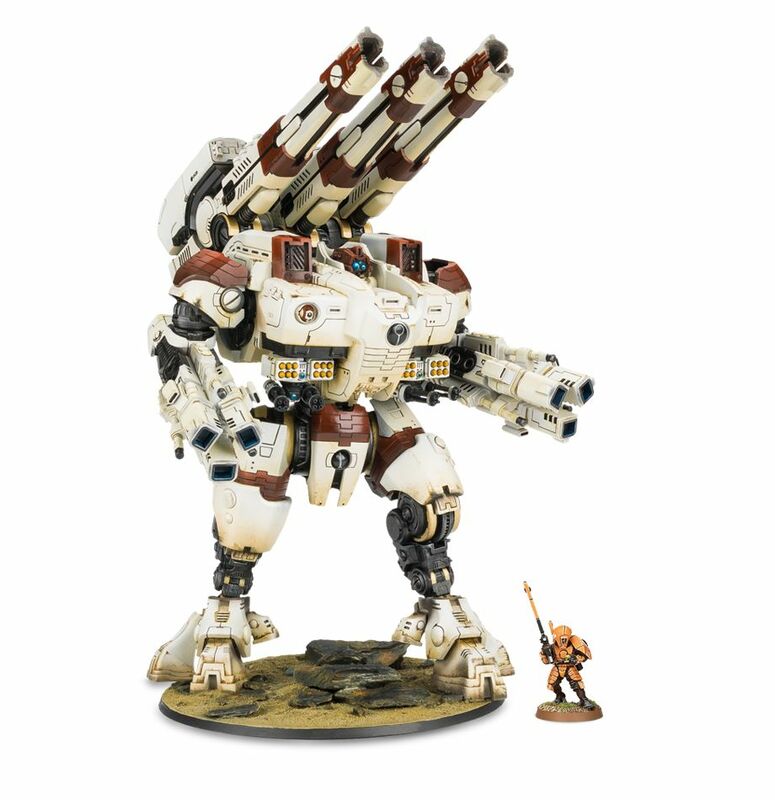 Shield Generators (rule amendment): Tau shield generator technology will be treated along the same lines as Void shields for Titans (in the Rites of Battle Deathwatch book). Shield generators will be assigned a Shield Point value which will act as a buffer for the PC benefitting from the shield generator. Shield Points will soak an amount of damage equal to their value (with penetration and special weapon qualities not being accounted for); damage in excess of the Shield Point value will then be transferred to the target (and penetration/special weapon qualities will function as normal). If a shield generator takes an amount of damage equal to or in excess of double its Shield Point value in a single round, it will overload. A Full Action Difficult (-10) Tech Use test is required to reboot an overloaded shield generator. Fire Warrior Combat Armor (gear amendment): Combat armor will now offer 7 AP to the wearer's off-hand arm to reflect the reinforced shoulder pauldron fielded by all Tau Fire Warriors. In addition to the increase in AP, any time a PC wearing Tau Combat Armor is the subject of a non-called shot head shot, roll 1d10. On a 7-10, the shot hits the 7 AP shoulder pauldron instead. Heavy Rail Rifle (updated weapon stats): Heavy; 300m; S/-/-; 4d10+10 I, Pen: 15; Magazine: 10; Reload: 2 Full; Felling (4), Proven (3), Reliable, Vengeful ( . - The Heavy Rail Rifle can also be loaded with Submunition Rounds: 2d10+5 X, pen 5; Blast (6) -OR- Kai'ju Hunter Rounds: 4d10+12 I, Pen: 15; Magazine: 1, Reload: 2 Full; Felling (5), Lance, Tearing, Vengeful (7). Rail Rifle (weapon amendment): Add Reliable and Vengeful (9) weapon special quality. Tau Marine Training (new talent; Tier 1, Agility and General): Tau Marines train extensively for ship based combats and are skilled in boarding actions and the variety of environments and perils such engagements can bring. They think nothing of fighting in micro or zero gravity environments as well as the hard vacuum of space or the scorching cold of the void. They also understand how their weapons work in such environments. When fighting in space environments (those with low or nonexistent gravity and with varying degrees of atmosphere and pressure), the PC halves all Test penalties resulting from environmental effects. Advanced Tau Marine Training (new talent; Tier 2, Agility and General. 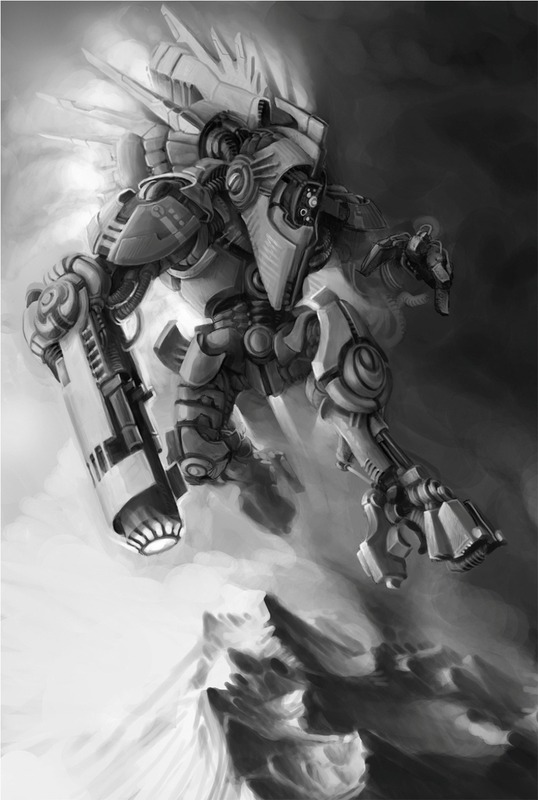 Pre-req: Tau Marine Training): The Tau Marine has perfected his zero-gravity fighting skills and ignores all penalties to tests caused by space environments. In addition to this, the Tau Marine not only is no longer impeded by space environments and variable gravity but has learnt to use it to his advantage and never suffers a reduction to his movement from such environments. Reaper Medicae Training (new talent; Tier 2, Intelligence & Knowledge): The Tau Empire consists of numerous auxiliary species who have joined the fight for the Greater Good. Some of these aliens are even good enough to be inducted into the ranks of the elite Reaper units. Due to their various physiology, advanced medicae techniques must be learned in order to treat them should they be injured in combat. A character with this talent no longer suffers the -20 medicae penalty for medicae tests on species other than its own kind. Earth caste scientists created this variant of pulse pistol after multiple requests for a short range, rapid fire personal holdout weapon. Rather than creating an entirely new weapon system, the engineers simply upgraded the rate of fire and magazine capacity of their impressive pulse pistols. It is less accurate than standard variants given its higher rate of fire, but makes up for this in potential damage output. These tools were originally designed to penetrate dense bulkheads and thick armor. They are used by Tau Breacher teams and, to a much more mundane extent, Earth Caste engineers. However, since the Tau Empire's first encounter with the space hulk Mortis Thule, they have been equipped on the rarely seen XV46 Vanguard Battlesuits - built exclusively for exploring and clearing the dense confines of space hulks. As well as practical tools, they are devastating, though clumsy, close combat weapons. *This weapon's distance can be increased at the cost of additional ammunition spent. Double the distance = double ammunition used, Triple the distance = triple the ammunition used. For example, firing at an enemy 6m away would cost two shots of ammunition. *Battlesuit versions are much larger and have an effective range of 20m. The "Close Range Engagement Anti-Personnel Weapon" was developed largely for repelling boarders during ship-to-ship engagements. However, it is also a popular weapon for special operations teams, or Pathfinders in urban/underground combat zones. It utilizes Rail technology to magnetically propel a large number of flechette rounds in a predetermined spread. The flechette rounds are housed inside small cylindrical gel-filled tubes which are then loaded into a box magazine that is fed into the underside of the weapon. When fired, the entire gel tube is sent down the length of the barrel, evaporating as it exits.The weapon is still an early development and rarely seen on the battlefield outside of officers and special operator's hands. It has been given the nickname "Rail Blaster" by the first special operations team that used it. The name has stuck since then. Can be used with specialty ammunition. Used almost exclusively by Tau Breacher Teams, the Pulse Blaster was the first attempt by Earth Caste engineers to create a close quarters pulse weapon that relied on the spread of the pulse energy rather than the range and accuracy. Field tests proved fruitful as this weapon is devastating up close. However, the energy redirection means that as well as a smaller magazine capacity than its rifle counterparts, at farther distances it loses its hitting power. Flame Projectors were first widely used after the Tau's violent and various encounters with the Orks. Devastating against large numbers of infantry, Heavy Flame Projectors are the most widely used variant - not capable of being mounted on anything smaller than a Battlesuit; however, some specialized units have been known to field standard flame projectors when facing Tyranids or Orks. The Kroot rifle employs modified ammunition and an improved firing mechanism, resulting in increased range and drastic reduction in noise when fired. Kroot forces using these weapons have employed them as sniper rifles, wielding them to eliminate key enemy personnel before launching a devastating assault. The Krootbow is an unusual weapon only rarely seen among Kroot auxillaries. At first glance, it appears to be nothing more than an unusual, if primitive, crossbow. Closer inspection reveals that considerable upgrades have been applied to this weapon, utilising unusual advanced magnetic technology of alien origin. It is suspected that some Tau artisan was involved in their construction, but whatever the truth, Krootbows possess a rotary firing system that allows the weapon to fire a flurry of quarrels with a single pull of the trigger. The quarrels possess mono-edged metallic heads and are often poisoned by the Kroot with various toxins. An EMP Blaster is an experimental Tau weapon that fires short-ranged rounds which explode in a small blast and generate an electromagnetic pulse (EMP) upon impact. EMP Blasters are issued exclusively to XV46-4 Vanguard Commander Variant Void Battlesuits. Whilst the weapon's rounds do not physically damage foes, they send out powerful electromagnetic pulses that disable electrical wiring and all kinds of mechanical systems, playing havoc with the internal systems of armour and other vehicles and disabling them temporarily. Sometimes, the EMP effect will even cause catastrophic failure in a system, leading to an explosive reaction for the unfortunate vehicle or robotic construct. The Flechette Discharger is an upgrade which can be mounted on Tau Vehicles. Clusters of powerful auto-reactive charges release a cloud of high-velocity anti-personnel flechettes if the vehicle is approached by the enemy, protecting it from close combat attacks. The cloud of shrapnel is often enough to take down the most tenacious foes, but the weapon is a last resort as it can only be fired once per facing (front, rear, left, and right) and must be reloaded again upon return to base. It would be a rare occurence for a crew to carry reloads. Pulse Bomb Generators are only ever mounted on Kor'vattra ships or Riptide battlesuits. They are massive weapons that generate a build up of plasma energy before releasing it in a fantastic burst of power that can decimate infantry and light vehicles in a large radius. The larger and more brutal cousin of the rail rifle, the heavy rail rifle is an anti-armour cannon, used to demolish enemy vehicles from long range or tear massive creatures limb from limb from well outside their effective range. This devastating weapon is often mounted on XV88 Broadsides, for only these modified variants of the XV8 Crisis Suit can effectively fire such colossal weapons. Specialized types of ammunition for this weapon can be found under the Ammunition section. These weapons are created and carried exclusively by honored Kroot warriors. Their construction requires painstaking effort by the Kroot to shape and mold heavy stone or metal into a devastating melee weapon. After the weapon has been shaped, the Kroot then take deadly talons, claws, teeth, or horns of much larger foes and bind them to heavy hammers. These weapons are especially deadly because the Kroot warriors only use remnants of their enemies that were coated in toxins. In this way, the Kroot would have been injured by, and overcome, the toxins. This ensures that when they eat their enemies who had been slain with this weapon, they can digest the poison within without injury.Great versions of these weapons require two hands to wield and are often only seen in the hands of teh fiercest warriors on the battlefield. Successful attacks with Kroot Claw Hammers confer a +5 attack bonus to the next attack of any allied Kroot within eyeshot. Secondly, these weapons are always considered to have been made out of "home materials" and grant +5 to any Fear tests. These swords are essentially Tarellian versions of the Imperial Chainsword. Seen as crude and dishonorable by their Tau allies, the vicious weapons are crafted from the ultra dense spine spikes of fallen Tarellian Dog soldiers. They rend horrible tolls against man and machine alike. Some Tarellians have gone to lengths putting a mono-edge on each spine for maximal penetration.These weapons are always considered to have been made out of "home materials" and grant +5 to any Fear tests. The fusion katana is an attempt at miniaturizing fusion technology into something that could be wielded by specialists good enough, or insane enough, to use in close combat. Miniature reactors located in the handle power the blade for as long as the weilder requires, but the design has not been perfected. As a result, they are prone to simply giving out. If set to maximal, the blade will put out an enormous amount of power, but will need to be recharged after. Tau EMP Grenades were designed to counter their own technology, should they ever encounter an enemy as technologically proficient as themselves. As such, they are devastating against similar mechanical devices fielded by their enemies. Pulse grenades are another experimental weapon developed by earth caste engineers in an attempt to outclass the fragmentation grenades often used by human forces. When triggered, the weapon builds up a small blast of controlled plasma, much the same way Tau pulse weaponry operates. While very powerful, the pulse blast dissipates quickly, giving the weapon a much shorter blast radius than Imperial counterparts. ・HRR Kai'ju Hunter Rounds (custom weapon/ammo) - Near Unique: This specialized round for the Heavy Rail Rifle was developed in response to gigantic threats encountered on the battlefield such as Imperial Knight Walkers, Warhound Titans, Gargantuan Tyranid Bioforms, and the like. When loaded into a Heavy Rail Rifle, the weapon adopts the following profile (4d10+12 I, Pen: 15; Magazine: 1, Reload: 2 Full; Felling (5), Lance, Tearing, Vengeful (7)). ・Penetrator Rounds (custom weapon/ammo) - Rare: Like anti-personnel rounds, penetrator rounds were developed by the Earth Caste to give squads more light anti-armor flexibility on the ground. Fitted into grenade launchers, penetrator rounds have the following profile (2d10+5 X, pen: 6; Concussive (0)). ・Rail Blaster Toxic Rounds - Very Rare: Tau scientists developed these rounds to ensure that enemies of the Empire wounded by the Rail Blaster went down and stayed down. Each pellet is coated in nerve-agents deadly to most lifeforms encountered. When loaded into the Rail Blaster, the weapon gains the Toxic special weapon quality. An array of shock dischargers, photon charge launchers, and wide-burst gravity pulse generators are mounted across the surface of the battlesuit, operating on subconscious mind-impulse triggers to ensure the fastest response to enemy attack. As a Reaction, when an enemy closes to within 2m, the pilot may trigger these defensive systems, making an Ordinary (+10) Ballistic Skill Test. If this is successful, then the enemy is shunted 1d5m away and must pass a Challenging (+0) Toughness Test or be Stunned for 1 round +1/2 DoF. "Blue Pills," as they are referred to in the field, are small capsules filled with nanotech that, when ingested, flood the system in an attempt to heal any wounds recently sustained. They have many pre-programmed function which include coagulating bloody wounds, preventing infection, and even increasing the rate of healing so that wounds mend themselves back together quickly. When ingested, PCs regenerate 1d10 wounds and are considered lightly wounded for purposes of natural healing; If critically wounded, successful medicae tests remove one additional critical damage. Usually only issues to battlesuit commanders, this device allows squad leaders and higher ranking battlefield coordinators a complete view of all forces in any given battle. The commander has access to a　persistent stream of tactical and strategic information, allowing　him or her a clear view of the theatre of battle. Using that information,　the commander can assist his subordinates with precisely timed　instructions. As a Full Action, the commander may nominate　a single ally he is in communications range with. That ally　receives an additional Full Action and an additional Reaction　before the start of the commander’s next turn. These units pick up the fields created by shield generators and latch onto them, increasing the radius by 100%. Kles'take explosives are affixed to their target with mag-adhesives designed to quickly adhere to metallic surfaces. They detonate with a powerful shaped charge, and are ideal for destroying bulkheads, vehicle hulls, and other heavily armoured targets. These explosives are typically unwieldy and not designed to be thrown, only placed in contact with their target material to ensure the charge explodes to maximum effect. *Treat the Kles'tak as a Demo Charge for the purposes of planting and activating. While worn, these boots reduce the wearer's Agility Bonus by 2 but they allow them normal movement in low or zero-gravity areas provided there is suitable surface to walk on. Using similar, albeit less advanced, technology as rail weaponry, these small pistols fire magnetic hooks that can adhere to most surfaces. They are connected to a small container on the shooter's armor which contains 100m of high strength line. The line can be manually climbed or automatically activated via a switch in the gun. Common sets can hold 150 kg and higher grade sets can hold 200 kg. Most often mounted on Battlesuits, the Tactical Net Control Unit (or TNC) can be wielded by infantry team leaders as well. It is linked to the advanced optics systems of Tau combat armor and housed on/powered via its backpack. When equipped, all characters linked with proper optical feeds receive a +5 bonus to Ballistic Skill Tests. If the equipped character spends a Full Action and succeeds on a +0 Tech-Use Test, this bonus increases to +10 until the end of the next Round. The effects of multiple TNCs are not cumulative. These links are installed into the top of fire warrior backpack units and form a link with whomever is fielding the Tactical Net Control Unit. by equipping the targeting systems of one or more squad members with a signum link, they can make optimal use of the signum’s readings to achieve unparalleled acts of teamwork by forming a web of their interconnected autosenses. This allows all participating members to make a concerted attack on the same foe, striking with a coordinated precision that makes their assault all but inescapable. When characters have formed a Tactical Net Web by linking to the TCN, all players may benefit from the effects of Ganging Up on a single opponent regardless of whether their attacks are WS or BS. Digital Shields use a kind of miniaturized shield-generator technology built into a wrist mount. When activated, they create a ultra focused force-field that is resistant to melee attacks as well as ranged attacks. Currently, they are only issued in small numbers to Tau Breacher teams. These pieces of hardware allow Drone Handlers to effectively control a number of drones slaved together over a network. Calibrating the Drone Controller takes Two Full Rounds and requires a +0 Tech Use Test. Once per round as a Half Action or Reaction, a player can make a +20 Tech Use Test to assume personal command over a drone until the end of the Round. While very useful, these machines are most effective in the hands of trained Drone Handlers. These drones are outfitted with Gravity Wave Projectors that throw back enemies closing to melee with the operator. As a Half Action or Reaction the operator of this drone may make a +0 Tech Use Test to activate the device. Utilized in a support role, these drones carry a markerlight to paint targets - making them easier to engage by allied forces. These drones are outfitted with shield generators that cover a radius of 2m. They are often used in conjunction with Field Amplifier Units. These drones are employed as force multipliers for Tau ground units. They have also been used extensively in ship-to-ship boarding and hit and run actions. When a heavier hit is needed, missile drones are the way to go. Armed with three shot missile pods, these drones are almost exclusively deployed alongside Broadside Battlesuits. They are most efficiently used in conjunction with a Drone Controller unit to get the best accuracy available. Developed to counter the heavy casualties suffered by Tau breacher teams, the MV36 carries a shield generator capable of forming a large umbrella over Breacher teams. As such, it has a much larger radius than standard shield drones. However, because of this increased radius, its shields are also weaker. 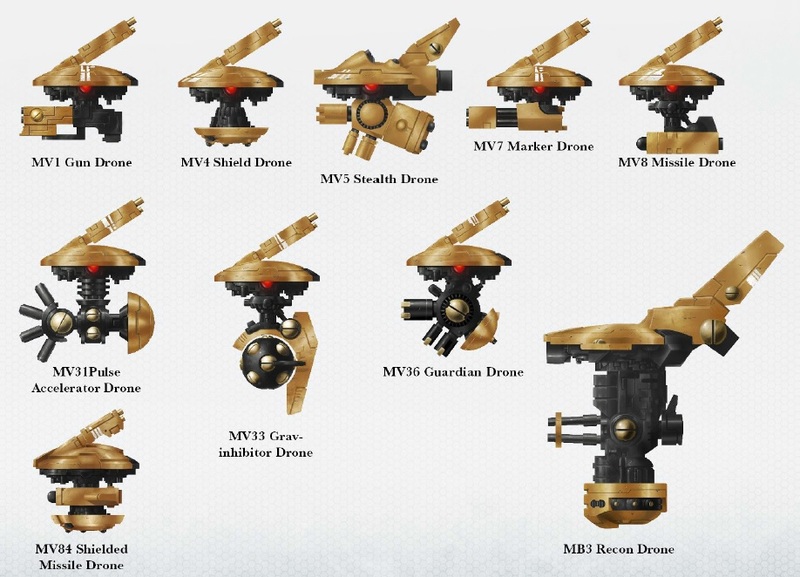 These drones are used almost exclusively by Pathfinder teams to take down high value targets with deadly precision. Another variant of the sniper drone, the rail rifle equipped version is for taking down heavily armored priority targets. 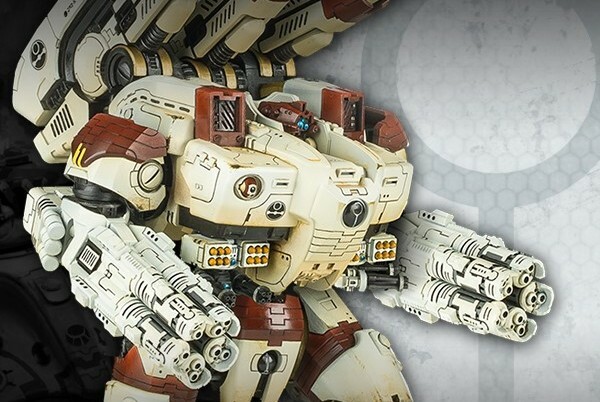 The KX139 Ta'unar Supremacy Armour is a type of super-heavy Tau Battlesuit. The largest class of Battlesuit in the Tau inventory, it is intended to meet a threat that the Tau Empire has not yet prepared for; the defence of worlds within their growing domain from the threat of other galactic races. Designed to counter anything from Imperial Knights to monstrous Tyranid beasts, the KX139 lacks the maneuverability of other battlesuits, and is instead intended for static defence, carrying massively destructive long range weapons. Earth Caste engineer Fio’o Ke’lshan Sho’aun developed the KX139 to mount a dynamic yet stoic defence against the enemies of the Tau Empire. 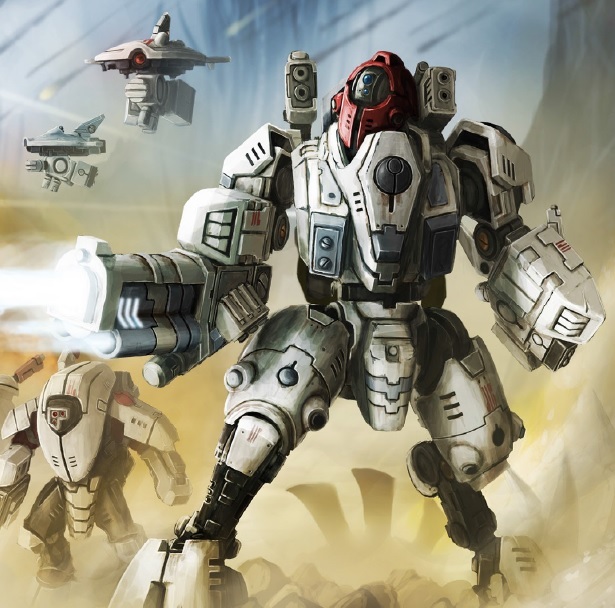 Development began after it was found that Tau heavy flyers such as the Manta were often outclassed against heavy enemy assault elements. The Stormsurge is a heavy weapons platform designed to serve as the Tau Empire's Titan killer, created by Earth Caste engineer O'Ishu'ron after Tau forces were frequently being outmatched by Imperial Titans and Super-Heavy Tanks. The KV128 was the first of the Tau's new generation of heavy artillery assets known as Ballistic Suits. Less maneuverable than a Riptide, such is the power of the Stormsurge's weapons that the suit is equipped with thrusters and retractable ground anchors to counter recoil. In truth, the Stormsurge is more of a walking tank than a true Battlesuit. Unusually for a Tau battlesuit, the Stormsurge has two crew instead of one. It is operated by a selected pairing of veteran Hammerhead crewmen, who have graduated in the ballistic suit academies on Bork’an. A Shas'vre experienced in Battlesuit piloting controls the suit itself, while a Ves'oni'Vash graduate controls the weapons systems. It is said that crewing a Stormsurge is less prestigious then a standard Battlesuit. The Shas'vre wears a hair braid to signify his rank. The Stormsurge's primary weapon consists of either a Pulse Driver Cannon or Pulse ARC Cannon but it bristles with numerous secondary weapons systems that include two Cluster Rocket System pods, four Destroyer Missiles, two Airbursting Fragmentation Projectors, two Smart Missile Systems, two Burst Cannons, and twin-linked Flamers. The immense power required for its weapons systems means that the Stormsurge is equipped with two slow-charge reactors. It is also used regularly as a platform to field-test experimental weapons so big and heavy they have previously only used on spaceships. The Stormsurge itself is transported into battle by specifically modified Tau Mantas. The XV95 was developed at J'kavo Station on the fringes of N'dras during the beginnings of the Third Sphere of Expansion. The program was launched on the orders of Aun'va himself. The XV95's first missions were highly covert in nature and included sabotaging Vadenfall Station and the assassination of Cardinal Bocsh. Its reputation soon led to its nickname, the 'Ghost of N'dras'. Soon enough the demand for XV95's increased exponentially and they began to operate openly on the battlefield. Each XV95 stands more than three times the height of the Space Marine and shares a similar design to the XV22 Battlesuit worn by Commander Shadowsun. Nigh undetectable thanks to its overlapping stealth fields generated by its Stealth Drones (with which the pilot forms an unnaturally strong bond while on extended missions behind enemy lines) and seemingly appearing out of nowhere thanks to a vast array of countermeasures, the XV95 will unleash a torrent of heavy firepower before retreating back into the confusion and chaos of battle. Enemies that attempt to retaliate will find that they are unable to lock their weapons onto the Battlesuit due to its advanced electronic warfare suite, and the Ghostkeel is also capable of creating holographic decoys if it comes under attack. The XV95 was primarily designed to operate behind enemy lines and spread panic and confusion. Indeed it is the epitome of the Tau war ideology known as the Mont'ka. The XV95 bristles with weaponry that includes a Fusion Collider or Cyclic Ion Raker and twin Fusion Blasters. The Ghostkeel's hand-picked Shas'vre pilot is supported by an integrated AI system that not only operates many of the suits more complex systems but also assesses his psychological well being. As Ghostkeel pilots are known to spend long periods in isolation behind enemy lines, many pilots form strong bonds with their suit's AI. Many pilots become so introverted that they shun physical interaction, preferring the company of their AI system. The XV46 Vanguard Void Battlesuit is a newly developed Tau Battlesuit that was designed by Earth Caste mechanics of the Tau Empire out of a need for a specialised Battlesuit to explore Space Hulks. 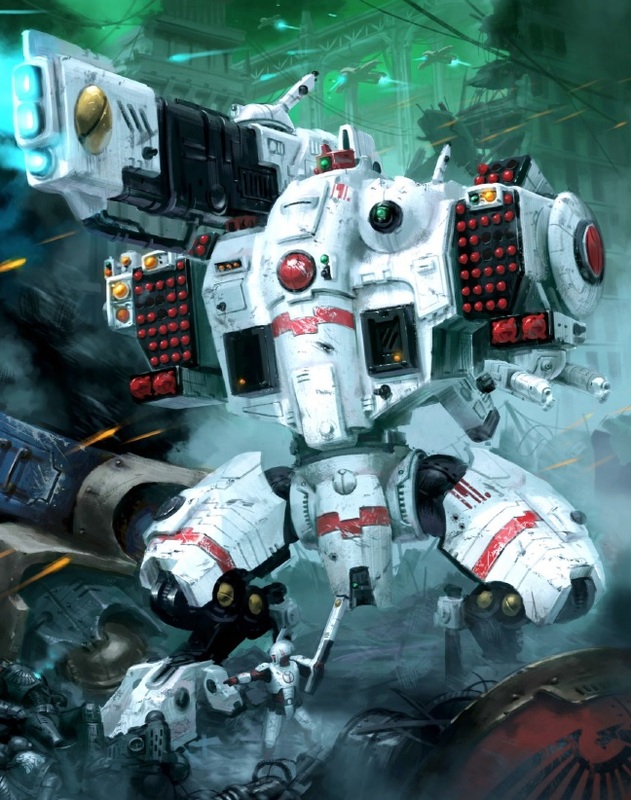 Initially conceived after a Tau expedition into the Space Hulk Mortis Thule in the Canis Salient of the Jericho Reach, these unique Battlesuits have yet to see widespread use amongst the Tau Empire. Their primary function is the exploration of derelict voidships, and whilst the Vanguard Battlesuits are fairly bulky, they are not as large as the more common XV8 Crisis Battlesuits and XV88 Broadside Battlesuits which would struggle to manoeuvre through the restrictive wreckage and cramped corridors of ship interior environs. XV46 Vanguard Void Battlesuits are also comparatively difficult to produce, even for the technologically savvy Tau, because of the advanced and miniaturised technology they incorporate. 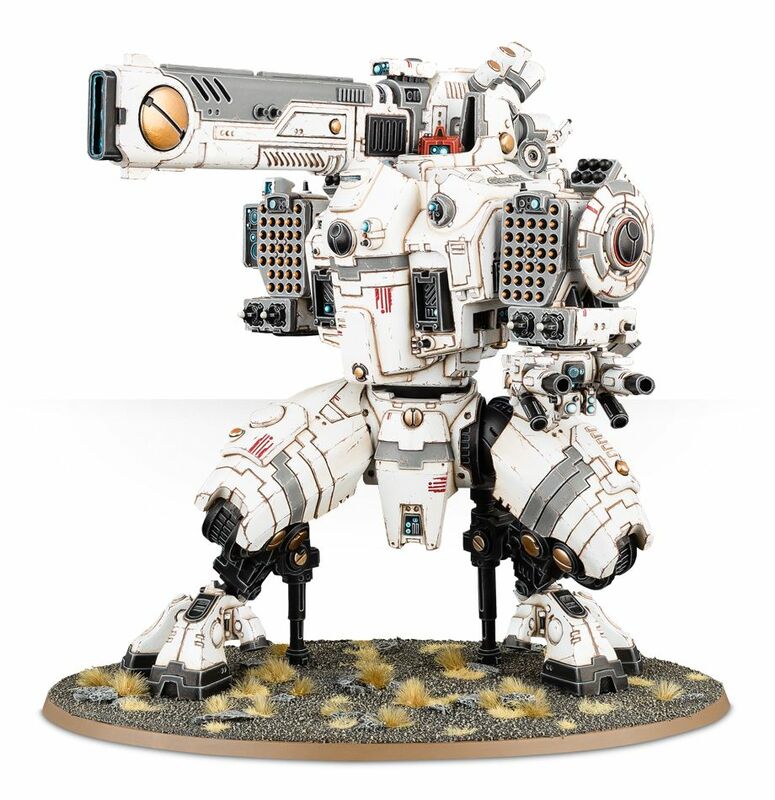 As a result, few of these Battlesuits currently exist in the Tau Fire Caste's arsenal.